Permanent Low Estradiol from Aromtase Inhibitors? I wanted to report on a couple of disturbing cases that have surfaced recently on the Peak Testosterone Forum, where a couple of men have reported that aromatase inhibitors have permanently crashed their estradiol. As I discuss on my The Need for Estradiol page, we men really do need adequate levels for endothelial (arterial and erectile) function, congitive and brain systems ( for libido), and bone mass maintenance. So it might seem like a good thing to eradicate as much of that "nasty female hormone" as possible, but, in fact, that's a virtual guarantee of misery and suffering. 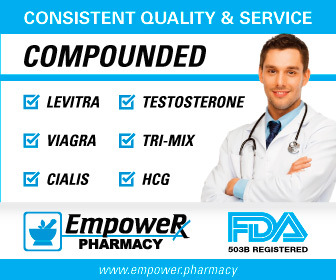 You need some estradiol just like your wife or girlfriend needs some testosterone. Fortunately, low estradiol is rarely an issue for men with respectable amounts of testosterone. (Low testosterone men are often low estradiol however.) Because we tend to gain weight as we age, estradiol levels (relative to testosterone) tend to go up. But imagine if the natural order was disturbed and a medication somehow permanently took out your estradiol. These men aruge that this is exactly what happened to them. Before I go on, let me just mention that literally millions of men have used these aromatase inhibitors and the vast majority do not report the kind of problem I am describing below. But I feel that my job is simply to report what we're seeing "on the field:"
CASE 1. Reversible Aromatase Inhibitior (Arimidex). The story of this poster is a bit unusual, but it started with him taking too much injectible testosterone accidently. His testosterone went above 1500 ng/dl and his estradiol (sensitive) climbed to 161 pg/ml, which is very high. Traditionally, he had been a lower estradiol guy, but this much testosterone really elevated his levels. When he discovered the high estradiol, he decided to take action immediately and took some Arimidex (anastrazole). Taking Arimidex as part of an HRT (testosterone therapy) protocol is actually quite common as men often find their estradiol a bit on the high side even though their testosterone is within youthful ranges. This generally occurs from weight gain as we age, but some men are just "high converters." a) His testosterone was quite high due to a personal HRT error..
b) Most men who crash their estradiol recover in just a few weeks. IMPORTANT CONCEPT: Arimidex is a "reverisble aromatase inhibitor." Reversible aromatase inhibitors attach only weakly to the aromatase enzyme and can easily be removed with harming it. Irreversible aromatase inhibitors are the opposite and powerfully bond to the aromatase enzyme. The chemical bonding that occurs in this case actually destroys the enzyme by effectively taking it out of commission. However, normally a man will rebuild these enzymes a few weeks later. CAUSE? Theory 1: Notice that in both cases testosterone was too high, an aromatase inhibitior was taken and then estradiol permanently tanked. Is this - the high testosterone - the common ingredient and the reason that these men's estradiol was set to near zero? And, if testosterone skyrocked, estradiol likely did as well and so perhaps super elevated estradiol levels reset gene expression or receptors? This theory seems doubtful, however, since literally thousands of steroid users use Aromasin. CAUSE? Theory 2: Could these men have high progesterone for some reason? High levels of progesterone would likely suppress estradiol levels through aromatase inhibition, something I discuss in my page on Progsterone Lowers Estradiol. CAUSE? Theory 3: Perhaps liver issues can explain these aromatase issues? One of the men wrote in a followup post that "Saw the new naturopathic doc. As expected he's being conservative and starting with the liver because it is so obviously overworked with a lot of different medications for various issues. Some are pretty tough on it. The liver enzymes I closely watch and treat with milk thistle and dandelion and have been in normal range over the years but according to him just because your enzymes are in range doesn't mean that there isn't a backlog on how the liver is addressing detoxification and protein synthesis and other things. For me, creating aromatase might just be a low-priority item that keeps getting knocked out of the queue every day. We're going with castor oil externally to help it detox." And the poster using aromasin had been using steroids and so it is possible that some supplement or something in his cycle aggravated his liver. CAUSE? Theory 4. In men with a weakened liver, Aromasin will lead to very elevated levels. The FDA wrote that "The pharmacokinetics of exemestane have been investigated in subjects with moderate or severe hepatic insufficiency (Childs-Pugh B or C). Following a single 25-mg oral dose, the AUC of exemestane was approximately 3 times higher than that observed in healthy volunteers. The safety of chronic dosing in patients with moderate or severe hepatic impairment has not been studied. Based on experience with exemestane at repeated doses up to 9 200 mg daily that demonstrated a moderate increase in non-life threatening adverse events, dosage adjustment does not appear to be necessary." Could this affect some men? 1) J Clin Endocrinol Metab, 2003 Dec, 88(12):5951-6, "Pharmacokinetics and dose finding of a potent aromatase inhibitor, aromasin (exemestane), in young males"